Exploring the underwater world is incredibly appealing as there is much to be discovered. Full of color, it is often hard to understand the full beauty of it due to the lack of light. 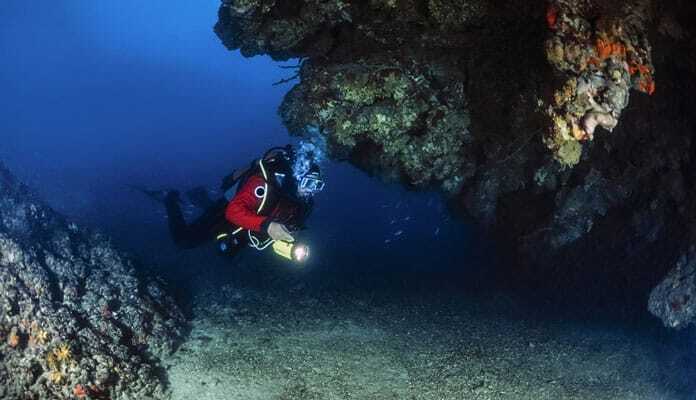 Not just required for evening dives, there are many caves and covered areas which require additional lighting. Having the best underwater scuba diving light will allow you to get the most out of your dive. As this is such an important addition to you dive set, we have constructed a list of the best dive lights on the market. The ThorFire Scuba flashlight is an excellent way to light your path. If you have a love for night dives this is an excellent addition to your gear. It has a 100,000 hour bulb life span which will keep you diving for as long as you want. Not only is this a lightweight device, but also a durable one. Made of durable aircraft aluminum this can handle the tough rigors of saltwater and being tossed around. 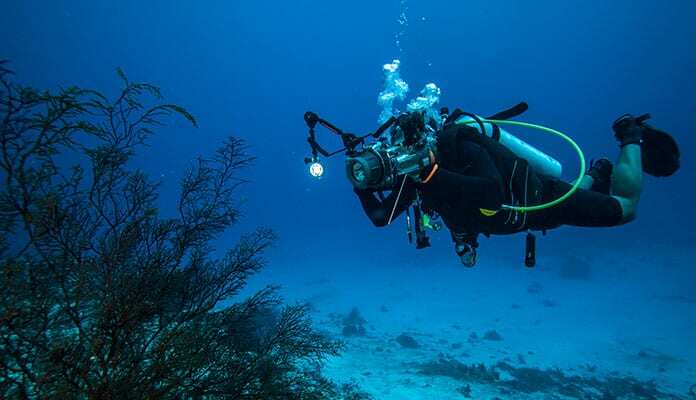 The maximum depth capabilities of 230 feet make it easy to take wherever you are diving. A set of three LED lights will illuminate your field of view easily and allow you to see everything clearly. The easy to operate circular switch allows you to change the brightness while wearing gloves. A well-made handle will allow you to sling it in a belt while you are getting yourself situated under the water. This is the best dive light that will serve you for years to come. This light has an impressive LED life cycle of 50,000 hours which means you don’t have to worry about your light dimming or not working on your dive. LED dive light reviews agree that this bulb creates the best underwater lighting. This is the best dive light allows you to travel to depths over 1000 feet. Running off just three C type batteries the Subgear Prolight Sp30 will be able to give you up to 18 hours of dive time. This is the dive light and excellent choice for your next scuba diving light. 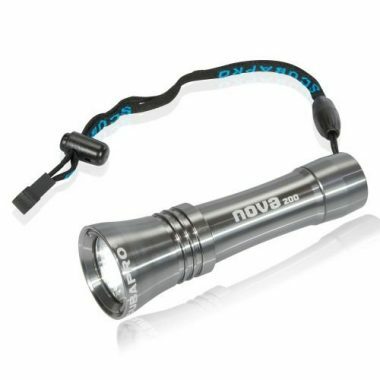 This compact light is a great buy for far more than just scuba diving adventures. It is a great camping light, car light, fishing light and can also be submerged 100 meters deep which makes it a great buy for all uses. Operated using a rechargeable battery will save you money over time. Dive lights reviews agree that a rechargeable battery is a feature to look for in the underwater world. This LED light is powerful enough to be used for underwater photography. Made using a high quality copper, it is recommended that you rinse your light with freshwater after every trip into the ocean. This OxyLED light is an excellent backup light. It doesn’t have the output as some of the other lights on this list, but is still an excellent light. The IPX8 waterproofing allows you to dive to a depth of 80 feet making this an excellent light for new scuba divers. Included in the price is a wall charger , lanyard and velcro wristband. Made of aircraft grade alloy and coupled with a durable coating this is a well made light that will stand the test of time. The three LED modes will ensure you always have the right brightness no matter what you are trying to see. The bulbs have a lifespan of 50, 000 hours which will allow you to dive with it for years to come. A small compact design will allow you to use it out of the water as well. Bring it with you in your inflatable kayak, or SUP and never have to worry about losing light again. This may seem like a simple light but it does it’s job well. Simply strap this to your wrist or body and have easy, quick access to light when you need it. A simple switch turns this light on with ease even wearing gloves. 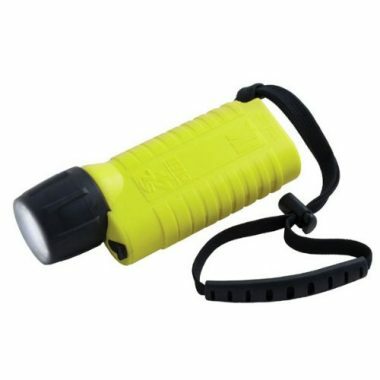 You won’t have trouble spotting this light in your pack as it is a bright yellow color. Simply unscrew the light to replace the four batteries needed to give this light power. This small, compact light is powerful enough to transform your dives. Giving off 1050 lumens of light from it’s rechargeable battery. This efficient light will give you 20 hours of use from a single charge of the battery. 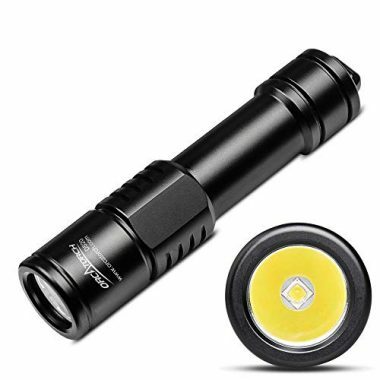 An IP68 waterproof rating translates into a 500 foot depth allowance for this flashlight while a retractable leash ensures this flashlight stays where you put it. 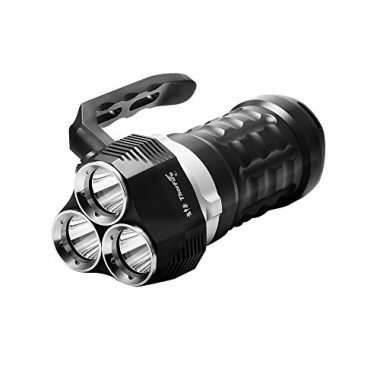 The aviation grade aluminum alloy build ensures that even after a couple drops the OxyLED DF10 light will continue to work. A tempered glass lens coupled with corrosion and shock resistant body means this light is top of the line and exceptionally durable. This whole package comes in a light that will fit into your suits pocket. 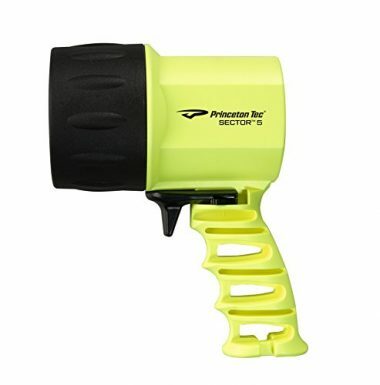 The Princeton Tec Sector 5 light is a spotlight type that has a large handle for any sized hands. An easy to use trigger style button turns the light on and gives you complete control. Run this light for up to 24 hours on a single set of batteries giving you enough time to explore everything you want to see. Pull the trigger part way for momentary light or pull it all the way for a constant stream of light. 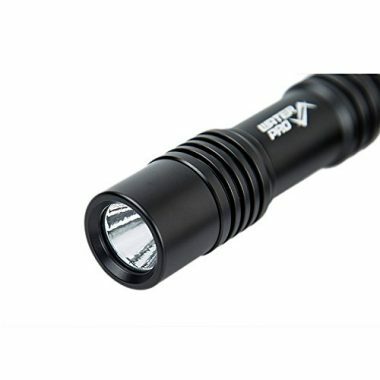 This easy to use light is lightweight and exceptionally durable. A closed system frame ensures no water will enter the housing while underwater up to 328 feet. 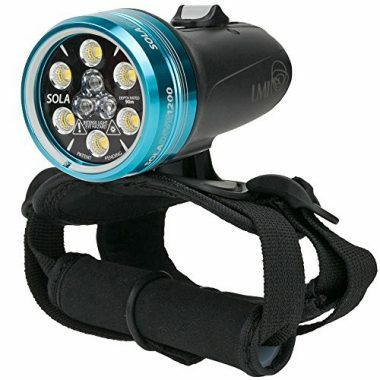 The Light and Motion Sola Dive Light is one of the best underwater scuba lights on the market. Utilizing the nine LED lights in dual beams with multiple power setting will allow you to easily illuminate the underwater world. This light is compact enough to be easily transported on your drives. A rechargeable battery allows you to dive without worry up to 100 meters deep for up to 270 minutes on low power. This lightweight hand-mounted scuba light can be converted to be used with cameras or video with ease. This high intensity underwater LED light burns between 14 to 18 hours which makes it a great option for any of your dives. 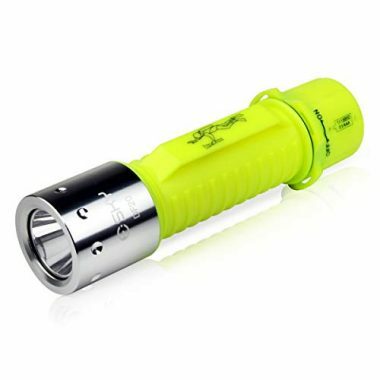 This scuba diving flashlight is strong enough to be reliable as your primary light but also compact enough to perform as a backup light. This light looks tough and it performs even tougher. This light is built to last and that is seen with its bright light, tough shell and long battery life. This is a multipurpose light. Not only will it go up to 80 feet underwater but is also perfect to throw in your car and use it for emergencies or for camping trips. You have a choice of battery types which allow you to use this with standard AAA batteries. While you’re diving strap this to your wrist with the thick, stretchy band. It also comes with a spot for a smaller strap to ensure it stays on your body at all times. The main body is made out of durable ABS plastic and the light’s frame out of a polycarbonate ensure this is a highly durable. To eliminate leaks the AuroraPolaris flashlight does not have any buttons. Simply turn the black ring to turn the light on and off and to utilize the three brightness modes. Scuba dive lights reviews speculate amongst what the most important feature in a dive light should be. However, the following features are agreed to be the most important features to look for. Typically, it is understood when looking for lights that brighter is better. This is no different in the underwater world, especially when diving at night time. Many lights will have an adjustable brightness that makes them perfect for any environment. Whether you choose a tight beam or wide beam flood depends mostly on the type of water you are diving in. Wide beams will illuminate a much larger area and are therefore most useful for clear water use. This will create the most visibility in wide open spaces. In murky water with less visibility you will want to opt for a light with tight beam rather than a wide angle. A tight beam will allow you to see further distances by cutting through the murkiness. This is similar to high beams being used in the fog. This is also useful when used for spotting or looking into tight spaces. There are features that make the best dive light. These have the ability to influence your safety and fun on your dives. Before getting into the water, especially for a night dive, you should understand the features of your dive light. 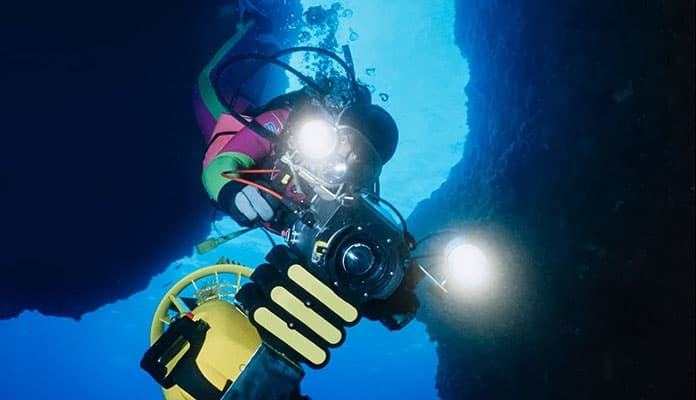 When diving at night you should dive with at least two lights for safety. This way, if one stops working you aren’t literally left in the dark. Your primary light will be the one you use during your dive. It will have the strongest lumen rating and give you the ability to see your surroundings. You should make sure this light is durable and has a full battery. The secondary dive light is essentially a backup. You will only use this light if your primary option doesn’t work. This means it should be somewhere on your body that you can get to easily and fast. Secondary lights are usually smaller than primary lights, which means they will have fewer lumens. Most people simply don’t understand what companies mean by beam angle. It is essentially how the beam of light interacts with the environment. For example, a wide beam angle will give you the widest field of view. Instead of forming a single beam of light it disperses it widely in front of you. A small beam angle will create a pillar of light. These lights are more for looking into crevasses or at a small point. With that being said, they can be good for diving in low visibility waters. A wide beam angle will shine light on all the particles around it while a small beam light will “cut” through them. When considering the type of battery to get for your underwater strobe, you are likely contemplating the best type to choose. This is an important consideration as the last thing you want is for your battery to die while underwater at nighttime. You will also want a battery that performs quite well to be sure to get the full brightness. Each battery type has its advantages and in turn a few disadvantages. You will want to take this all into account before choosing the right ones for you. This is a great option for travelers as they are found almost everywhere in the world. They are also relatively inexpensive making them a great choice for those on a budget. With that being said, alkaline batteries certainly do have their flaws. They have a lower performance level and the battery life on these is quite short. This battery type is a better choice as it provides superior performance. Being more eco-friendly, these batteries can be recycled after use. Function comes at a price as these are not found as commonly as alkaline batteries and are quite a bit more expensive. For those traveling it is worth noting that these batteries are often difficult to get on a plane. This is the ideal choice for frequent divers. An excellent choice for both the environment and your wallet these batteries perform quite efficiently. It is worth considering that you will need to allow for time in between dives to recharge your battery. For travelers, these battery types also require access to electricity which can be difficult when in a foreign area. You may be overwhelmed by the selection of lights on the market. From LED, HID, and XENON the choice isn’t as hard as it seems. A XENON type dive light will be the least expensive but also have the lowest lumen rating of the three. XENON is a fancy way of saying incandescent. This type of light requires a lot of battery power to keep it shining bright, meaning it will also have a short battery life. Why people like this type is because of the natural light it makes. Instead of a sharp white light, XENON makes a softer more natural dive light. This makes it great for underwater photography. LED dive lights will provide some of the brightest light while lasting the longest. They are one of the most efficient light bulbs available. This means they will also give you the longest battery life. With that being said, LED lights can create a colder light with blue hues. High intensity discharge (HID) dive lights are the previous generation of LED lights. They were popular years ago but LED lights have surpassed them. Q: How Many Lumens For A Dive Light? A: There is no one answer to this question. 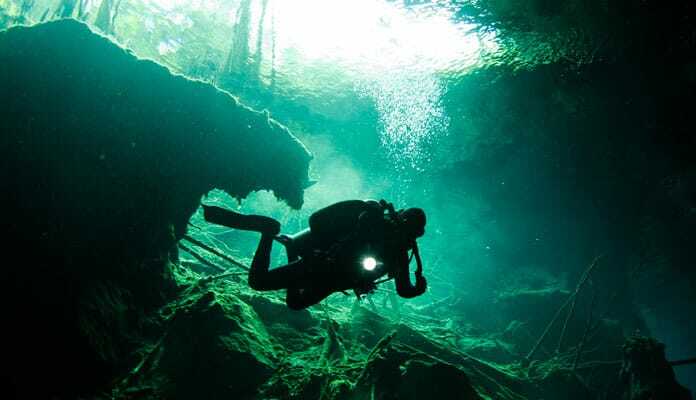 One dive may require a light that has 500 lumens while another dive 125 lumens would work. All of this can vary depending on the location and environment you’re diving. For example, if you’re planning on diving a shipwreck a lower lumen light will work, especially if you’re diving during the day. This will allow you to navigate the rooms of the ship without having to carry a large light around.Night dives may require a more powerful light. For this environment, a light with around 500 to 800 lumens will be the lowest you’d want to go. Q: How To Choose The Best Dive Light? A: Knowing the environment you’ll be diving in will help you determine the right light for you. If you are looking for the best dive light that has the capability to switch between lumen settings will be best. 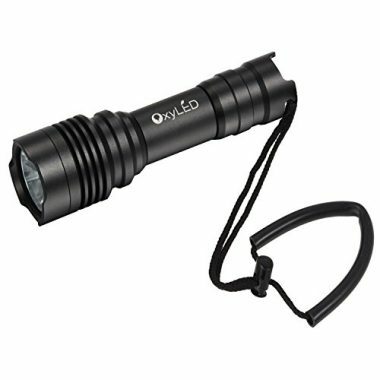 For example, a light that can be switched from 100 lumens to 500 or even 800 lumens will be best for nearly every scenario you throw at it. Q: What Is The Brightest Dive Light? A: There are dive lights that push the 1000 lumen limit. Even though these lights exist we don’t recommend you get them. These lights are actually too bright. Keep in mind, even on night dives you will be diving with other people. If you have the brightest best dive light possible you can affect their dive as well. Exploring the underwater world is an excellent experience and opens your eyes to an entirely new ecosystem. Even under the bright daytime sun, diving 30 feet underwater will require at minimum a compact backup light to maintain good visibility. This number can be greatly reduced if diving in murky water. When diving at night time it is essential that you have both a primary and a back up light on hand. Having the best dive light is important so that you can enjoy the full beauty of this largely unexplored underwater world. 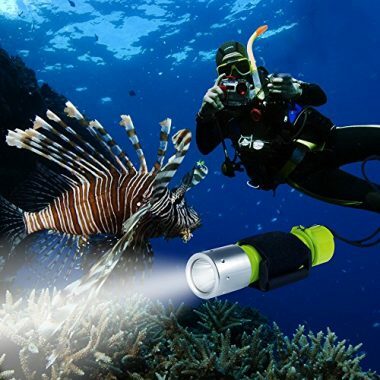 Do you use a dive light for your underwater adventures? How was your experience using them? Let us know in the comment section below.